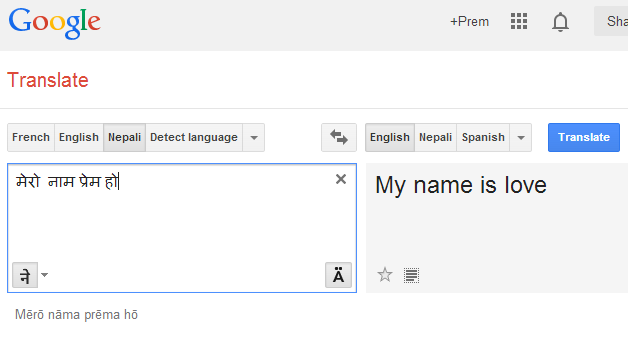 Google Translate has now added support to translation in Nepali language. This is another good news to the Nepali Language lovers, with the first one being "Hamro Nepali Keyboard" which lets you type in Nepali right from your Android Smartphone. Google Translate as of now is capable of doing correct word to word translation only. The sentence translation are still quite a mess and there's a long way to go before its translation becomes satisfactory. However, it is a good news for us that Google gave us a priority and included our language in its translate product. For the past couple of days, the Twitter and Facebook timelines were occupied with Google's amusing translations. A lot of people had fun testing it and making fun of the wrong translations, which was not unusual. I just knew the meaning of blah blah. Thank you Google Translate! If you want to laugh, go to Google translate and translate some text into Nepali. Complaining that Google doesn't translate correctly, is like saying that a new-born child cannot walk properly. How about giving feedback to improve translation rather than making fun of the incorrect translations. Either way, it was fun to see wide range of views from different people and their discussions in the social sites. Being a viewer has its own appeal and I love to watch this difference in the nature of the people. Had there been people of the same nature only, this world would have been too monotonous and boring. The diversity and differences are more appreciated than the similarities! You can help to improve Google Translate by giving feedback to it on the wrong translations. That way we would get the better translation much sooner. So, I appeal every people who is good in both English and Nepali language to help Google Translate become a better product for Nepali translation. Google Translate is a great tool and has great business implications. Google Translate is meant to reduce the cost of translation for printing houses and press organizations. Similarly, it will be a tool that will, in future, become a mediator (or translator) for businesspersons, employees and so on and will facilitate them to engage in business deals and operations, especially in the context of online-business and online jobs, where people work for clients from across the world. Translate software like this will make knowledge and information more accessible to people. With over 80% of the current online content available in English language, this becomes useful to only those who can comprehend English proficiently, which comprises of only about 25 to 30% of the world's population. Therefore, Google Translate and similar software, can make 100% knowledge available to the 100% people of this world. This in turn, can make trading and conducting business possible anywhere in this globe.